Master developer Dubai South has awarded a Dh300-million ($81.65 million) contract to Tristar Engineering and Construction for infrastructure works at its flagship Residential District in Dubai South, Dubai, UAE. 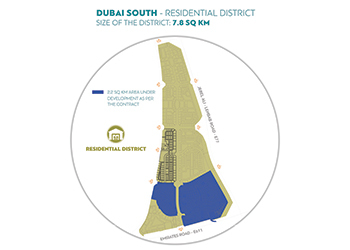 Central to the contract is the delivery of the completed infrastructure works of Phase One and Two of the Residential District by Q4, 2017. Khalifa Al Zaffin, executive chairman of Dubai Aviation City Corporation, comments: “The award of this contract is a huge step forward for Dubai South’s Residential District and we are delighted to be working with Tristar. “We are honoured to be appointed as the contractor for this prestigious infrastructure and roads project for Dubai South Residential District. This contract further cements our long and continued collaboration of more than 10 years in successfully executing and delivering major earthworks, heavy infrastructure, and roads projects in the Dubai South Development. Tristar E&C is the company that Dubai South can rely on in terms of commitment and exceptional quality of works and assured delivery for this highly important project and for future projects as well,” says Naji Hasan Al Harthi, chairman, Tristar. The scope of the work spans 2.2 sq km and covers complete community infrastructure work, including roads and potable water, sewerage, storm water drainage, combined irrigation and fire-fighting, and district cooling networks; electrical and telecommunication works, streetlighting, gas network and spare ducts. Mobilisation will begin immediately, with work due for completion by the end of 2017.